“Joseph Medill of the Chicago Tribune regarded the President as a kind of personal property, and when his faction seemed not to be securing its share of the patronage he raged: ‘We made Abe and by G- we can unmake him…'” wrote historian David Donald.1 The Chicago Tribune viewed itself as a founding stockholder in the Illinois Republican Party and as such entitled to regular dividends. Medill was editor and co-owner of Chicago Press & Tribune. After a career in Ohio journalism, he was introduced to Charles Ray by Horace Greeley as a possible partner in the purchase of the Tribune in 1855. Cartter later was named to a Washington judicial post. I send you Douglas’ late speech in Columbus Ohio. You will see the new grounds he takes and the new coloring he gives to his old dogmas I observe that you are invited to make speeches in Columbus & Cincinnati. You will draw big crowds and be well received. I know the Buckeyes well – being raised in that state. Do not consider me presumptuous for offering a suggestion or two, viz: As you are not a candidate you can talk out as boldly as you please. There is no Egypt in Ohio Any doctrine you can teach in Bloomington will take in Columbus. Cincinnati is nearly as radical as Chicago. They are willing to obey the Fugitive law but want it repealed or modified and have so declared in their platform. Medill first preferred fellow Ohioan Salmon Chase for the Republican presidential nomination in 1860. In October 30, he wrote that “Personally I prefer Gov. Chase to any man – believing that he possesses the best executive ability but if he is not considered available is not Old man the man to win with.” Medill added that “the friends of the gallant old Abe will never consent to put the tallest end of the ticket behind.”9 Eventually, Medill helped pushed Chase supporters to Lincoln and guarantee his nomination. Indeed, the Tribune editors operated in their own self interest to promote Chicago as the site of the Republican National Convention. Medill himself personally went to New York in December 1859 for a meeting of the Republican National Committee to lobby for Chicago. Since Mr. Lincoln had not yet emerged as a prominent candidate, the selection of Chicago did not seem to favor one candidate over another. Medill later claimed to have had a critical role at the convention at a point when Mr. Lincoln was within a few votes of victory. He deliberately sat with the Ohio delegation in order to influence their votes, most of which were pledged to Salmon P. Chase: “After the second ballot, I whispered to [Chairman David] Cartter of Ohio, ‘If you can throw the Ohio delegation for Lincoln, Chase can have anything he wants.’ ‘H-how-d-d’ye know?’ stuttered Cartter. ‘I know, and you know I wouldn’t promise if I didn’t know,”Medill declared.”12 Cartter switched the votes and Mr. Lincoln was nominated. By the end of the year, Medill was in great alarm – this time about Mr. Lincoln’s prospective appointments to his Cabinet – especially the rumors that Pennsylvania’s Simon Cameron would be named Secretary of the Treasury: “We feared that Lincoln was too much indebted to certain factions and now it is proved. Lincoln is a failure. Perhaps it is best to let disunionists take Washington and let Lincoln stay in Springfield.”14 Medill was furious that Mr. Lincoln was once again ignoring the Tribune owners. He wrote partner Charles Ray: “If the reports from Springfield are true, there will not be one original Lincoln in the cabinet. It will be made up from many of his competitors, and enemies. The Cameron, Seward, Weed, George Low, Caleb B. Smith, Dr. [Charles] Leib, [Chicago Journal’s Charles] Wilson, John Wentworth tribe of thieves, jobbers and peculators will control ‘honest Abe’ body, soul and boots….We made Abe and by G- we can unmake him.”15 Not even the prized appointment of a Tribune staffer – John L. Scripps – as Chicago’s postmaster appeased the Tribune management. After Mr. Lincoln’s inauguration the editors turned truculent. Medill and Ray quarrelled over the paper’s treatment of John C. Frémont’s military leadership in Missouri; Medill saw his incompetence before Ray. 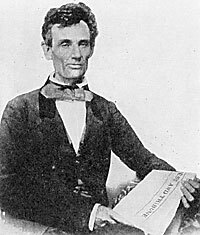 Medill became frequently critical of President Lincoln and moderates within his administration. He repeatedly tried to stiffen the government’s policy, writing President Lincoln after the attack on Fort Sumter in April 1861: “The North West will back you with their last man dollar and bushel of corn. The authority of the Govt. must be made good. Do your duty; the people are with you.”16 There was often a note of asperity in his letters. “Our nation is on the brink of ruin. Any steamer may bring the news of European intervention – the people know that when that happens the Union is gone, and the curse of posterity will rest on the memory of those who fooled away the day of grace. The verdict will be, ‘the harvest is past, the Summer is ended, but the nation is not saved. To placate a few hundred Kentucky slave-masters this great Republic was allowed to be shivered by rebellion and foreign intervention,'” he wrote in February 1862. Historian Mark E. Neely, Jr., wrote: “Medill became increasingly exasperated at Lincoln’s Cabinet selections, at the slow pace of the war once it began, and especially at Lincoln’s slowness to move against slavery. His letters became shrill: ‘for God’s sake and your country’s sake rise to the realization of our awful National peril,’ he told Lincoln early in 1862; Lincoln should not shape policies merely to ‘placate a few hundred Kentucky slave-masters.”18 Medill was a strong advocate of emancipation – and strong supporter of the Emancipation Proclamation. When Medill had been in Washington in May 1863, he had written: “Not having either time or inclination to hang round waiting rooms among a wolfish crowd seeking admission to your presence for office or contracts or personal favors, I prefer stating in writing the substance of what I would say verbally. Your army is melting away rapidly by battle, disease and expiration of term of service, and there is great delay in putting the conscription act into effect.” He then proceeded to give his advice on the Army draft. Medill was elected mayor of Chicago in 1871 before returning to running the Tribune for the remainder of his life. David Herbert Donald, Lincoln’s Herndon: A Biography, p. 153-154. Rufus Rockwell Wilson, editor, Intimate Memories of Lincoln, p. 154 (Joseph Wilson Fifter, speech to the Illinois Bar Association, 1880). Jay Monaghan, The Man Who Elected Lincoln, p. 179. Roy P. Basler, editor, The Collected Works of Abraham Lincoln, Volume II, p. 473 (Letter to Joseph Medill, June 25, 1858). Don E. Fehrenbacher, Prelude to Greatness: Lincoln in the 1850s, p. 124-125. Jay Monaghan, The Man Who Elected Lincoln, p. 124-126. David Herbert Donald, Lincoln, p. 217. Abraham Lincoln Papers at the Library of Congress. Transcribed and Annotated by the Lincoln Studies Center, Knox College. Galesburg, Illinois. (Letter from Joseph Medill to Abraham Lincoln, September 10, 1859). Reinhard H. Luthin, The First Lincoln Campaign, p. 73-74 (Letter from Joseph Medill to Archibald W. Campbell, October 30, 1859). Jay Monaghan, The Man Who Elected Lincoln, p. 142-145. Melvin L. Hayes, Mr. Lincoln Runs for President, p. 61 (Saturday Evening Post, 1899). Roy P. Basler, editor, The Collected Works of Abraham Lincoln, Volume IV, p. 111 (Letter to Joseph Medill, September 4, 1860). Jay Monaghan, The Man Who Elected Lincoln, p. 202-203. Jay Monaghan, The Man Who Elected Lincoln, p. 204. Abraham Lincoln Papers at the Library of Congress. Transcribed and Annotated by the Lincoln Studies Center, Knox College. Galesburg, Illinois. (Letter from Joseph Medill to Abraham Lincoln, April 15, 1861). Phillip Shaw Paludan, The Presidency of Abraham Lincoln, p. 171. Mark E. Neely, Jr., The Abraham Lincoln Encyclopedia, p. 208. Michael Burlingame, editor, With Lincoln in the White House: Letters, Memoranda, and Other Writings of John G. Nicolay, 1860-1865, p. 115-116 (Letter to Chicago Tribune, June 19, 1863). Don E. and Virginia Fehrenbacher, editor, Recollected Words of Abraham Lincoln, p. 326 (Ida M. Tarbell interview with Joseph Medill, June 25, 1895). Abraham Lincoln Papers at the Library of Congress. Transcribed and Annotated by the Lincoln Studies Center, Knox College. Galesburg, Illinois. (Letter from Joseph Medill to Abraham Lincoln, February 17, 1864). Abraham Lincoln Papers at the Library of Congress. Transcribed and Annotated by the Lincoln Studies Center, Knox College. Galesburg, Illinois. (Letter from Joseph Medill to [John G. Nicolay], ). William Frank Zornow, Lincoln & The Party Divided, p. 34. Joseph C. Waugh, Reelecting Lincoln: The Battle for the Presidency, p. 142. Ward Hill Lamon, Ward H. Lamon and the Chicago Tribune, p. 5.